4. a departure from the original or from what is pure or correct. Where as world bank’s conventional definition of corruption is ”the ‘abuse of public office for private gain”. Liberating ourselves from the way World Bank wants us to think, if we stick to the broader and a more meaningful meaning of Corruption, as noted in the Webster, I believe corruption is not definitely something that was created during last 15 years of democracy. For the sake of time and space I’ll confine myself to the most recent history of our political geography and will start on June 23rd. June 23 of 1757 was the day when general Mir Zafar betrayed his leader Nabab Shiraj ud Doula and helped Col Clive win the battle of Plassey. I don’t know whether Mir Zafar stole money from the exchequer, but I know, for sure, that his act of treachery/ corruption sold the independence of Bengal to East India Company. Then we saw repeat of this history many times, Mir Zafars kept on returning on every act of the political theater of Bengal. British Raj created a Babu class who will act against the interest of their creed and the country for materialistic benefits. Material benefit drove people to sacrifice their loyalty, allegiance, virtue all throughout the history. In Bibhutibhushan Bandyopadhyay’s literature, you would not be able to finish a full sentence without getting the description of dozen of different flora, starting from the century old shade trees to the little grass flower. Bibhutibhushan was the master in bringing up the real nature of Bengal in his letarature. As clearly depicted by Bibhutibhushan, an exceedingly lively nature and rich biodiversity made the landscape of Bangladesh. Several years ago, I had an opportunity to travel to the Chimbuk hill at BandarBan hilly district. While I expected a visual commentary of Bibhutibhushan, I was shocked and saddened to see an indiscriminate massacre of nature. The arakan mountain range that runs parallal to the coast line through Chittagong or the more intimidating landscape of the hill tract districts used to be home of dense lush green rain forest and was inhabited by an amazing range of creatures. Wild elephants used to roam along the foot of the hills in dense jungle, they also used to have leopards, porcupines, gibons, orang otangs, deers, bears, pythons, Nil Guy etc. Now-a-days, this dense green rainforest has turned into governments fruit gardens. For many decades, there have been government programs of planting fruit trees along all the rainforests and to accomodate more fruit trees there have been more felling of trees that were meant to be there naturally. Tagore wrote, “Oi Maloti lota dole, pial o toru ro kole”. As both Maloti lota and pial toru are not lucrative, they have to give way for Ipil Ipil trees or amra gardens. News #1 Major General Sina Ibn Jamali is tipped to become president of Bangladesh Cricket Board, currently headed by agriculture secretary M Abdul Aziz. News #2 The director of Dhaka Medical College Hospital (DMCH), Brigadier General Sarkar MA Matin, has been made director of the Directorate of Drug Administration (DDA), the establishment ministry said Thursday. News #3 The ministry also issued a circular on the appointment of Bangladesh Air Force squadron leader Md Moniruzzaman Hawlader as counsellor of the labour wing of Bangladesh Embassy in Abu Dhabi. News #4 Major Rakibul Hasan of Bangladesh Army has been appointed to Bangladesh Telecommunication Regulatory Commission as deputy director. News #5 Lt general Hasan Mashud Chowdhury is appointed chairman of Anti corruption commission. News #6 New appointments were made in the top posts of Dhaka Export Processing Zone (DEPZ), BTRA (Bangladesh telecommunication Authority), BRTA (Bangladesh road transportation authority). And all the new appointees are generals. News #7 For the first time in the history, even an election commissioner was selected from the ranks of the retired military community. Are military bureaucrats better, more efficient, more honest than civil bureaucrats? I’ll put a list of retired civil and military bureaucrats and let you judge by their long lasting contribution to the country as well as their reported corruption. This list is just a snapshot or random sampling. Please fill me in with more names if you think that would change any general stereotyping or skew the results. Weekly 2000 is a weekly that belongs to the house that publishes two other famous daily, The Daily Star and highest circulated vernacular daily Prothom–Alo. Although I personally still believe in Editor/Publisher Mr Mahfuz Anam, overall, I am shocked at the shameless reactionary stand, ill-motive of this group to promote certain agenda of this military backed mystery government. This cover story is another example of the arrogance, dirty political activism and biased yellow journalism lately coming out of this media house. Otherwise why this media house will promote Mannan Bhuiyan so shamelessly? Did this precocious editor Golam Murtaza ever have anything good to say about Ziaur Rahman? I am really intrigued why he suddenly would start worrying so much about the real image of Ziaur Rahman. These pictures and the news relating to these pictures dominated the first pages of today’s newspapers. This is the picture of Army Chief self promoted general Moeen reminding and lecturing the nation to respect the ‘father of the nation’ Bangabandhu. Gen Moeen was speaking at a civil meeting at gen Moeen’s home constituency at Noakhali. While our generals occupy the front page of the newspapers, a one column news may miss your eye at the 15 the page. Khaleda Zia’s personal physician was picked up after he was leaving Khaleda Zia’s home and he is missing for the last 24 hours. Also in the news was the continuation of public political activities of Mannan bhuiyan at his Gulshan flat. Last night Bangladesh Hindu porihad leaders visited him asked for 57 parliament seats. So already the seat distribution has started. BTW, I forgot the name of the Hindu font of jamaat i Islami. I know they have one, but I forgot the name. Nation, rest in peace. Military has no plan to take over civilian rule. They call the disease ” Mass Hsteria”. Suddenly groups of people, mostly young women are getting sick in a tandem. Their sickness menifests as losing consciousness, seizing/twisting/ bow like bending of the whole body, experiencing severe belly pain, burning of whole body, severe headache, temporary blindness, vomiting etc. Experts call it mass hysteria. Simply a psychological phenomenon tempting and forcing the effected people to fake all these illness, whereas there is no real physical illness or problem. This illness has a contagious nature and people exposed to other hysteric patient are vulnerable to developing the disease themselves. There have been a lot of discussion about this illness in Bangladesh media and advocacy groups are demanding appropriate psychological support for the school/college students. And fortunately, it looks like that the phenomenon has already slowed down. While this mass hysteria is on the way to a cure and elimination for the time being, we should start talking about another mass hysteria that has apparently effected the whole nation. As a result of the above mentioned mass hysteria victims suffered from bodily pain, seizure, headache etc. But this other kind mass hsyteria effecting the whole nation is presenting as hallucination and delusions. The mass hysteria effected Bangladeshi nation is hallucinating that current ruthless military government is the ultimate savours and the great emancipator. Their hysteric support for the disguised military government has reached such an extreme that they have lost their sense of judgement and rationale. However it is expected that the nation will recover from the mass hysteria quite rapidly. Setting a rare example, BNP Chairperson Khaleda Zia yesterday demanded immediate release of her arch political rival Awami League (AL) President Sheikh Hasina, and regretted failure of the administration to protect her [Hasina] dignity while being taken to court. 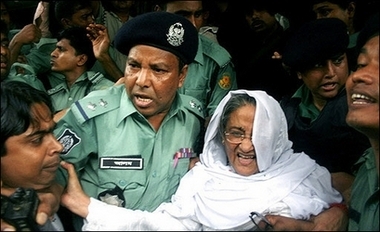 “I am deeply disheartened to see that being a former prime minister, chief of a political party, daughter of a national leader, an aged woman as well as a distinguished citizen of the country, she [Hasina] faced a disgraceful and indecent situation on the court premises,” Khaleda said in a statement, signed by Maruf Kamal Khan, deputy press secretary to the former prime minister. BNP leaders however said they are not aware of any such statement. “It [indecent situation] hurt all conscious people and destroyed the image of the government both at home and abroad,” Khaleda said. The situation could have been avoided if the government would have dealt with the matter carefully and consciously, she added. 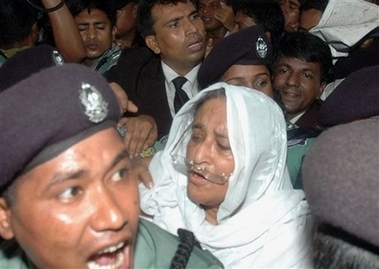 Calling for immediate release of Sheikh Hasina, Khaleda stressed conducting the case keeping her free. It would decrease the possibility of social and political instability and confusion. The people do not want to see chaos and disorder again which led to promulgation of ‘unexpected’ state of emergency. Extension of emergency would not however bring any good to the county, she said. “We have to move forward toward our desired democracy. Ensuring stability and establishing national consensus are necessary for this,” Khaleda said. Everybody should be more foresighted and should exercise wisdom as the opportunity is now created. Mentioning that none is above the law, she said nobody is also above error. And those who discharge major responsibilities of a country beset with problems have the more chances of committing errors. Successes of politicians should not be underestimated because of their failures, the former premier observed. “I was hurt by the illogical, non-political and indecent speeches of Sheikh Hasina against me and my family many times, and I am also hurt in the same way to see her facing unexpected behaviour,” Khaleda said. “Accused persons may or may not be guilty. So, it is the duty of the government and administration to protect their honour and dignity,” she said. Every accused should get justice, and his/her right to defend, legal assistance and human rights should be ensured. I am amazed at this statement. Not only because it is an unimaginable U turn in the attitude of one feuding leader towards the other but also at the strength and quality of the statement. It is, in my opinion, one of the best political statements in Bangladesh politics I have come across so far. This exceedingly well crafted piece articulates its message very clearly. This piece captured an issue which was unfirtunately missed and overlooked by everybody else, even her own party colleagues. Khaleda Zia was apparently the first one to bring up the issue of the treatment extended to Sheikh Hasina at court house. Another reason this statement carries weight is that it signals that Khaleda Zia probably is not all by herself in her struggle with the Mannan Bhuiyan gong. This statements clearly indicates that Khaleda is being advised by someone very prudent and capable in writing and promoting certain political points. I hope she continues to get the support and good advise.